Featuring the voices of John C. Reilly, Sarah Silverman, Gal Gadot, Taraji P. Henson, Jack McBrayer, Jane Lynch, Ed O’Neill, Alfred Molina, Alan Tudyk, Sean Giambrone, Flula Borg, Timothy Simons, Ali Wong, Hamish Blake, GloZell Green, Rebecca Wisocky, Sam Richardson, Jaboukie Young-White, Maurice LaMarche, Melissa Villaseñor, Ana Ortiz, Dianna Agron, Tim Allen, Brad Garrett, Anthony Daniels, Nicole Scherzinger, Vin Diesel, Irene Bedard, Kristen Bell, Jodi Benson, Auli’i Cravalho, Jennifer Hale, Kate Higgins, Linda Larkin, Kelly Macdonald, Idina Menzel, Mandy Moore, Paige O’Hara, Pamela Ribon, Anika Noni Rose, Ming-Na Wen and Bill Hader. Screenplay by Phil Johnston, Pamela Ribon. Directed by Phil Johnston, Rich Moore. Distributed by Walt Disney Studio Motion Pictures. 112 minutes. Rated PG. In a November ripe with sequels, Ralph Breaks the Internet manages to hold on to most of the charm of the original. It also adds an inventive take on what the internal workings of the internet universe looks like. And (in a particularly great addition) it makes a case for heroine Vanellope to join the ranks of the Disney Princesses – as she hangs out with ALL of the princesses and even convinces them to wear comfy clothes. The headline characters of 2012’s Wreck-It Ralph are back. Ralph (voiced by John C. Reilly) and Vanellope (voiced by Sarah Silverman) lead the cast as best friends caught in a bit of a rut. After a long run as an arcade bad guy, he is satisfied with his new life in spite of its predictability. Young Vanellope is still in search of something more but is also grateful for her friendship with Ralph. In Ralph’s effort to maintain his hero status to Vanellope, he creates an alternative tack in her arcade game. This ends in disaster for Vanellope’s arcade game – a broken steering wheel for an archaic, no-longer-made game. She and her fellow characters are at the risk of becoming unplugged, and homeless, when Vanellope and Ralph discover that everything can be bought (for a price) on the internet. 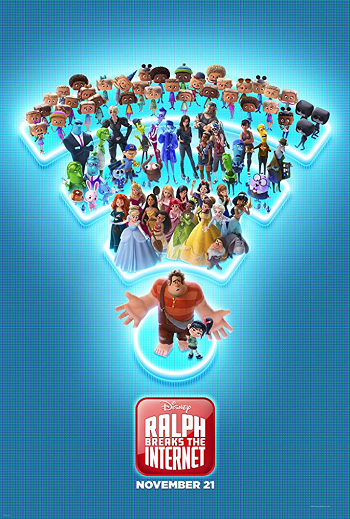 While the opening scenes bring us back to the old-charm arcade life, as the title implies, the majority of Ralph Breaks the Internet is based in the face-paced world of the internet and a whole new cast of characters. Knowsmore (voiced by Alan Tudyk) is the search engine. His running gag is that he is always trying to figure out what the searcher is searching for before they say it. It is funnier than it sounds. Yesss (voiced by Taraji P. Henson) is the go-to woman for going viral and gaining hearts/dollars from the internet. She guides Ralph on the best videos to make to garner attention from his newly-forming internet audience. Shank (voice by Gal Gadot) is my new favorite animated character. Her car is a high-dollar internet prize that people are willing to pay top dollar to procure. She should be a viper of a woman, pretty but vicious. Instead, Shank has been developed as an ally to Vanellope. She is cool, supportive, and strong, everything you would hope for in a mentor. Hats off to her creator, with hopes that the animated film world creates more like her! The Disney Princesses. All of them. Voiced by their original actresses. This isn’t a spoiler – they are even on the poster. Their scenes are magic – funny, entertaining, and a fan’s dream as they spoof themselves. As my daughter Leni pointed out, seeing all of the Disney Princesses together on the big screen was everything you didn’t know you wanted to see. Ralph Breaks the Internet is a bit manic in its fast pace and fine details. This is not the film you want to watch for post-Thanksgiving self-reflection. But it’s a super entertaining romp to pass the time between holidays. I look forward to watching it again to catch whatever details I missed on the first go-round. Copyright ©2018 PopEntertainment.com. All rights reserved. Posted: November 21, 2018. Tags: Alan Tudyk, Alfred Molina, Ali Wong, ana ortiz, Anika Noni Rose, Anthony Daniels, Auli’i Cravalho, Bill Hader, Bonnie Paul, Brad Garrett, Dianna Agron, Disney princesses, Ed O'Neill, Flula Borg, Gal Gadot, GloZell Green, Hamish Blake, Idina Menzel, Irene Bedard, Jaboukie Young-White, jack mcbrayer, Jane Lynch, Jennifer Hale, Jodi Benson, John C. Reilly, Kate Higgins, Kelly Macdonald, Kristen Bell, Linda Larkin, Mandy Moore, Maurice LaMarche, Melissa Villaseñor, Ming-Na Wen, movie review, Nicole Scherzinger, Paige O'Hara, Pamela Ribon, Phil Johnston, PopEntertainment.com, Ralph Breaks the Internet, Rebecca Wisocky, Rich Moore, Sam Richardson, Sarah Silverman, Sean Giambrone, Taraji P. Henson, Tim Allen, Timothy Simons, Vin Diesel, WRECK-IT RALPH. Bookmark the permalink.